TO SEE MY BREAKFAST CASSEROLE RECIPE, GO HERE! Friends! I am so excited to introduce you to my new friend, Caroline! She is so sweet and she is all about living a healthy life. She is a mom and ALL her recipes look DELISH like these Buffalo Chicken Sweet Potatoes (those kiddos are LUCKY!). I know many of you have completed Whole30 with me in January and y’all are always looking for new Whole30 recipes to add to your repertoire. Whether you are thinking about starting a round of Whole30 or just want some good, clean, paleo meals to add to your meal plan, this one won’t disappoint! I can’t wait to make it myself. Be sure to give Caroline a follow @OliveYouWhole on Instagram and let her know I sent you. Enough chatting – here is her amazing recipe! Let me introduce myself! My name is Caroline Fausel and I run the blog Olive You Whole. We talk all about clean eating and living. I’m a Whole30 certified coach, so I love creating Whole30 recipes and resources to make your Whole30 as easy as possible! I married my college sweetheart, Chaz. He’s finishing up the LONGest process ever of medical school, residency, and fellowship! We just moved to Denver! We have two precious kiddos- Ella is 5 and Owen is almost 3! 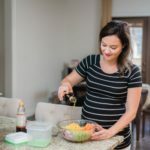 I have completed 8 rounds of Whole 30 since June 2014, and with the better understanding of what makes us healthier, I created Olive You Whole to share healthy and clean recipes. 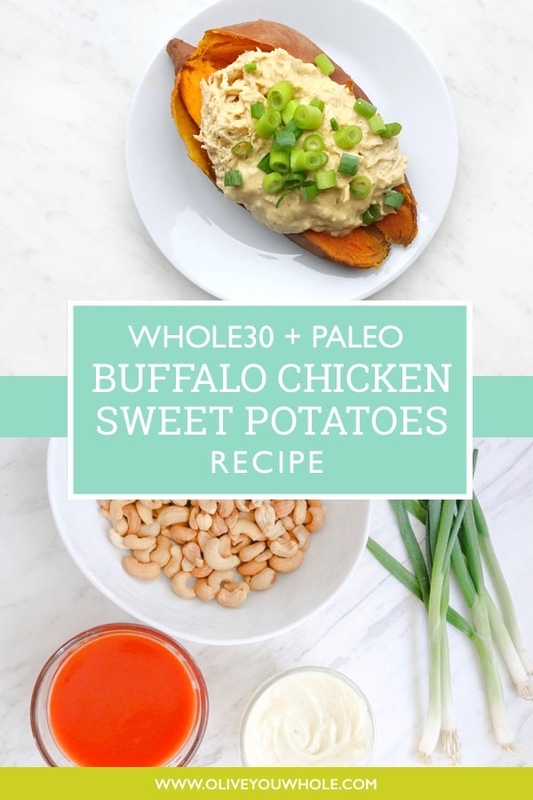 You are going to LOVE these Whole30 + Paleo Buffalo Chicken Sweet Potatoes! These are a hit with everyone in my family AND for anyone who has had the chance to be over when I make them! They’re a major crowd pleaser! One of my BIG mantras is that sauces and flavor are what MAKE a Whole30! When I first did a Whole30 in June of 2014, there were NO brands making Whole30 approved sauces. ZERO. These days, I am SO thankful for how much easier Whole30 is as a whole with approved, ready-made sauces! 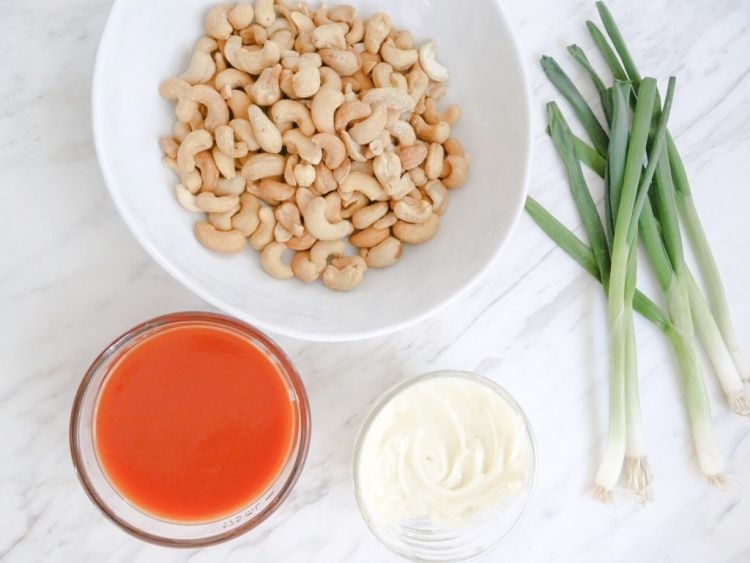 This recipe calls for a clean buffalo sauce- like the one from Tessemae’s! One thing you’ll need to know before getting started is this recipe calls for Paleo Mayo. 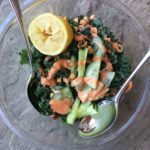 I’ve given the options here so you can either make your own using this recipe, or here’s an entire summary of all of the Paleo Mayos you can choose from! I love how as time goes on the more approved products make their way into stores to make Whole30 even easier. I highly recommend you play around and get creative with the toppings- my family has been topping them with green onions and extra roasted, salted cashews for some yummy crunch! Truly any nuts for crunch are good- especially sliced almonds! 1 c Tessemae’s Buffalo Sauce …or more if you like it spicy! Preheat oven to 425. Poke each sweet potato with a fork a few times to allow steam to escape. Wrap Sweet potatoes in foil and cook on a baking sheet for 45 min-1 hour, depending on the size. Remove from the oven when the potatoes are soft when pierced with a fork. 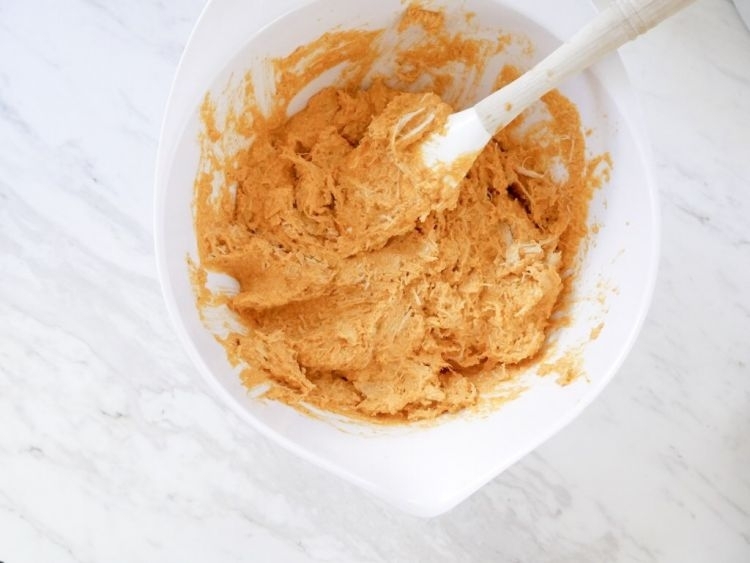 Blend cashews, lemon juice, nutritional yeast, full fat coconut milk, gelatin, Tessemae’s Buffalo Sauce, mayo and spices in a blender or food processor until smooth. If needed, add water 1 T at a time until smooth. In a large bowl, mix the buffalo sauce and shredded chicken. If you didn’t just cook and shred your chicken, you can add all ingredients to a pot and warm over low heat. 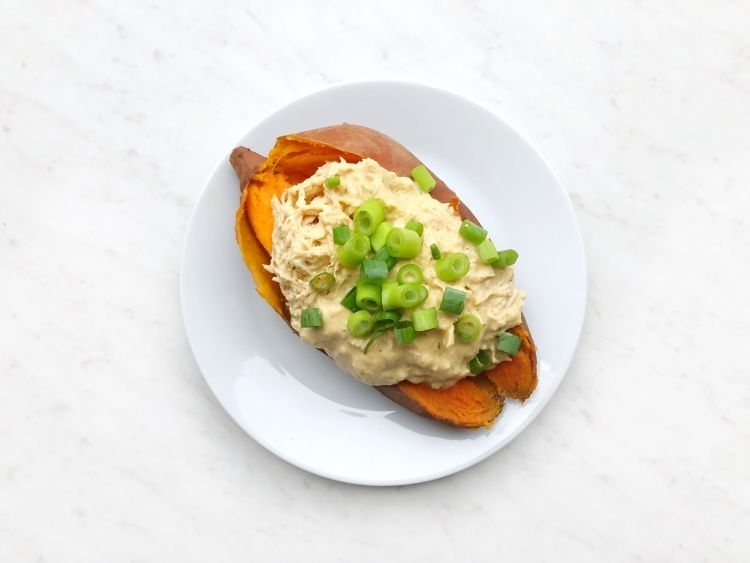 Slice the baked sweet potatoes in half lengthwise and stuff with your buffalo chicken! Top with sliced green onions and salted cashews, optional. I told y’all you would love Caroline! I’m not sure about you but my mouth is watering! I can’t wait to test out the Buffalo Chicken Sweet Potatoes! 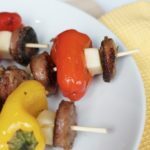 If you are looking for other Whole30/Paleo recipe inspiration? Check out a few of my favorite recipes below!